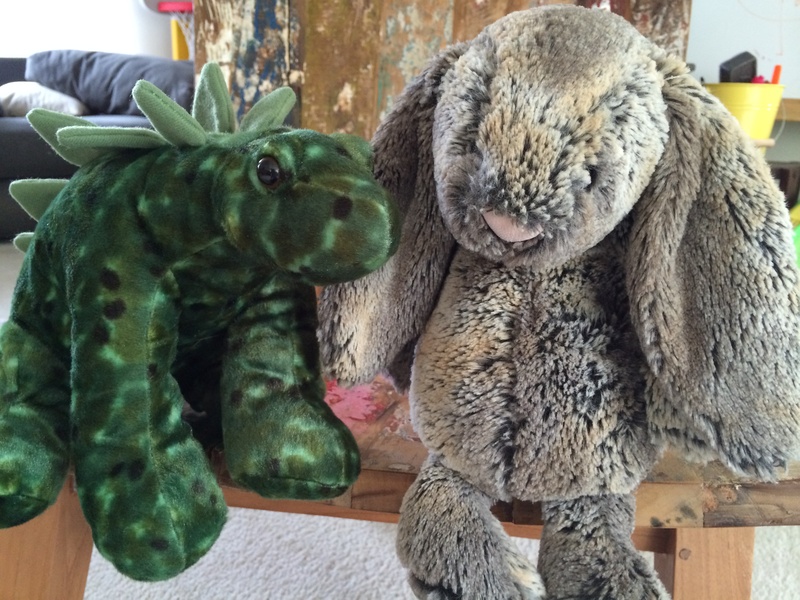 Grey brown Bunny and green Stegosaurus were an unusual yet true pair. The two were the best of friends and found, unexpectedly, many things in common, such as a love of gardening, funny jokes, and peach ice cream. Though one was rather introverted and the other rather extroverted, they had a kindred sense of humor, and conversed in an open and easy manner about most subjects. They rarely wondered at the other’s meaning or mood, and were comfortable being (necessarily at times) quiet with one another. They also shared a herbivorous appetite, a great convenience not lost on either, particularly bunny, who was a wonderful chef and had longed (before Stegosaurus) for a friend with whom he could dine. One afternoon Bunny invited Stegosaurus over for a salad made fresh from ingredients in his garden. Stegosaurus of course accepted with delight. On his way, he stopped at a nearby spring to fill a medium gourd with cool water for his host and found himself listening (Stegosaurus was an excellent listener) to Mrs. Otter about recent events in the Otter family. This didn’t take too long, and anyway Stegosaurus liked Mrs. Otter’s rolling “r”s when she told stories. Soon he found a good moment to say goodbye and hurried off to Bunny’s. Due to the spring and rolling “r”s, he arrived a little bit late, but that didn’t bother Bunny who knew that though his friend often overestimated the clock, he always spent his time with the best intentions. After a warm welcome and some jokes, Bunny and Stegosaurus decided to eat. Suddenly, while adding the final touches of chive and chopped basil to his beautiful salad, a sinking feeling came over Bunny. He had forgotten plates! Earlier in the week he had leant all his plates to Mrs. Otter who was having a den party for her niece and was short on dishes for the many extended relatives. Oh, how could he serve his beautiful salad to his most important friend with no plates?! He felt flushed and disappointed, his happy plans wilting. Stegosaurus saw the fallen look on his dear friend’s face and asked whatever could be wrong. Bunny explained the problem, but to his surprise Stegosaurus only laughed and smiled. “Bunny,” he said, “I forgot to tell you! Mrs. Otter gave me your plates at the spring. She knows we’re the best of friends and asked if I’d be seeing you soon. I told her I was on my way to our house that very minute and would be happy to deliver them. She stacked them on my back, but your jokes were so funny that they slipped my mind and I suppose they are hidden from view amongst my own plates!” Bunny laughed too, relieved, and stretched high to reach the stack on Stegosaurus’ back. The two friends dished up medium sized portions of salad onto the returned plates and poured cool water into their cups. They laughed and conversed with ease, and after a delicious meal (and a scoop of peach ice cream each), they sat quietly and contently together. I do in fact have some lovely, leafy green salad plates which also would have been hidden indeed on Stegosaurus’ back. Such a dear is Bunny who takes his friend’s best intentions. Lovely. This is charming! You inspire me to try and create some stories with our grandgirls’ favorite lovies here at our house. Thanks so much. love this, fully brings these guys to beautiful life – when’s the book coming out? Loved it so much….I read it twice!